For the second time tonight, I stopped by a garden on my milk route -- my weekly bike ride to pick up the raw milk a cooperative of Portlanders buys from the more permissive Washington -- and picked several kinds of raab, a few spring onions and garlic, some collard greens and mustard. The owner, I've been told, is planning to rent the home and hasn't worked in the garden for months; I've been given permission to pick a little, and I've been as respectful as possible. Though I long to eat every blossom, worried the tenant-to-be won't know what to do with all of this. Emboldened by my one successful bout of volunteer harvesting (well, there were a few apple and fig trees last summer, too), I'm determined to do more of it. So many kale plants are gone to seed around southeast Portland (I can't help but notice), and I've been marking the fig and cherry trees, raspberry bushes and grape vines in my memory. I can't let one more season go by without helping use some of this abundance. What's more, the rhubarb! So many plants all over the city, so many enormous leaves, can anyone possibly make that much pie? I have a recipe for rhubarb clove cardamom sauce that would make a fabulous jam (I've had it on toast, trust me), and I'm not at all shy about trading produce for jam. If you've got the inclination, I'll even teach you how to make your own. 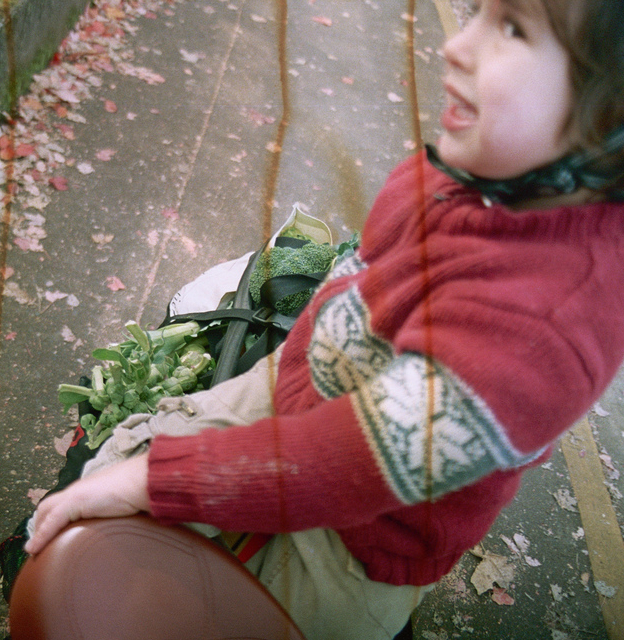 I have a bike, and I'll happily come to you and harvest your unwanted vegetables and fruits. Leeks shoulder to shoulder? Grapes galore? Kale gone to seed? Let me know. I'll be there in a jiffy.